Canoe raffle winners pick up their prize. 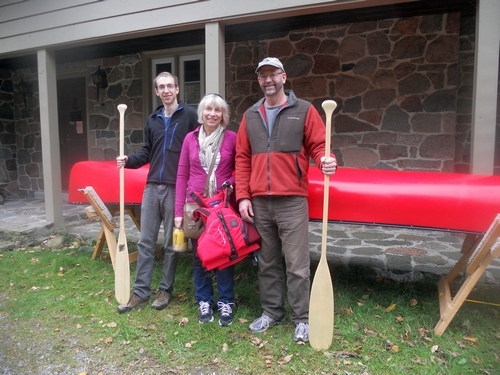 The winners of this year’s draw for the ClearWater Designs Kawartha canoe are John and Lesley Cree and their sons, Warren and Graham, from North Gower, Ontario. The Crees have been regular campers at Presqu’ile for many years, having pitched their tents and explored its many trails and habitats every spring for the last 26 years, and John looks back to his childhood in Trenton when his family camped at Presqu’ile long before that even! Though bicycles are their favourite mode of transportation when at Presqu’ile, the canoe will be put to good use on Ontario’s lakes and rivers since the Cree family also enjoy canoeing and wilderness camping at every opportunity. Actually Lesley’s name was on the ticket so I guess there is going to be some demand for the canoe.